By CCN.com: The US stock market could fall prey to deflation and tumble into a full-blown bear market in 2019. That’s what Yale University professor Robert Shiller, a Nobel Prize-winning economist, said at the 2019 World Economic Forum in Davos, Switzerland. Shiller says the Dow Jones has been recovering from its plunge in late-2018, but there’s still a risk of a major downturn ahead. There is a feeling that the stock market might be due for some deflating now because it’s been a long time. We’ve seen some hints of it. And we haven’t seen the real deflation yet. 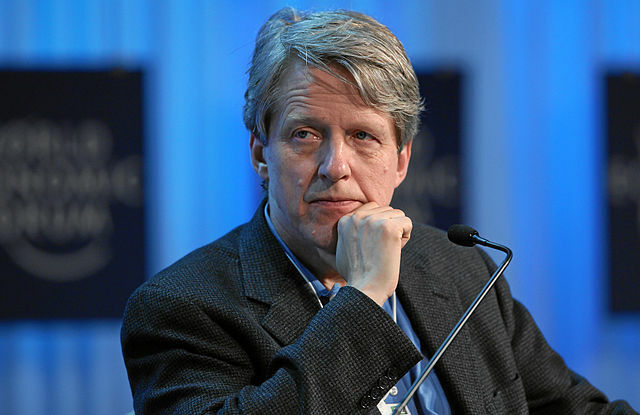 Shiller ― who won the Nobel Prize for economics in 2013 ― is famous for his work in spotting financial bubbles. He underscored that his bearish outlook is based on psychology and media “narratives” ― and is not based on market fundamentals. Shiller claims “narratives” played a major role in causing previous US recessions in 1920, the 1930s, and 2007-2009. I have this quarrel with economists about fundamentals. I’m writing a book on ‘narrative economics,’ and think it is stories that drive markets more than fundamentals. So basically, Shiller is predicting a bear market while writing a book about how “bear-market narratives” can actually trigger them. Robert Shiller is echoing the sentiments of other noted economists. They warn that recessions and bear markets can become self-fulfilling prophecies. Since these other economists have real-world experience with money and aren’t academics who only traffic in theory, one could argue that their assessments might be more reliable. For example, Mohamed El-Erian — the chief economic adviser at German mega-bank Allianz — warned that the media hysteria about a recession could actually trigger one. “I’m stunned by all this talk of recession,” El-Erian told CNBC in December 2018 (video below). We’ve got to be careful because we can talk ourselves into a recession. That’s how bad technicals become bad economics. Mohamed El-Erian said the stock market would remain volatile in 2019 due to financial uncertainty in Europe and China, but there’s no real concern that the United States will tumble into a recession. Portfolio managers believe recession is near.